Global Mobile Alert offers a Cellular Telephone Safety System technology that delivers unparalleled insight into potential roadway hazards for a significantly safer and more aware driving experience. Available as the Global Mobile Alert app from Google Play and the App Store, or as The Solution™ for integration with partner solutions such as vehicle navigation and Smart City systems, Global Mobile Alert’s innovative offerings form the foundation of the burgeoning vehicle-to-everything (V2X) market.The Global Mobile Alert solutions use sensors and algorithms to warn drivers of everyday hazards. 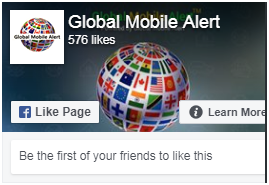 The Global Mobile Alert connected mobility solutions were invented by Demetrius Thompson, the founder and CEO of Global Mobile Alert Corporation. Thompson set out to create this life-saving technology after being hit not once, but twice by distracted drivers. The result is two powerful solutions that provide both drivers and developers of smart vehicle and Smart City systems with extensive capabilities to take advantage of increasing connected vehicles and infrastructure and reduce the dangers of distracted driving.